The Frustrating misconceptions about visas. If there’s one thing that gets me most passionate, most vocal, and most annoyed, its the topic of visas. Visas, ah, bane of my life. Our whole life is determined by visa applications and the result of them, the verdict reached by someone sat a desk in an office making assumptions about our intentions and relationship. I can deal with that, it was a choice we made, a life we chose to follow when we met each other and started our relationship, although recent changes in the law have made things more difficult, it’s still something we just have to accept. What I do find hard to deal with, and what really frustrates me more than anything is people’s ignorance. 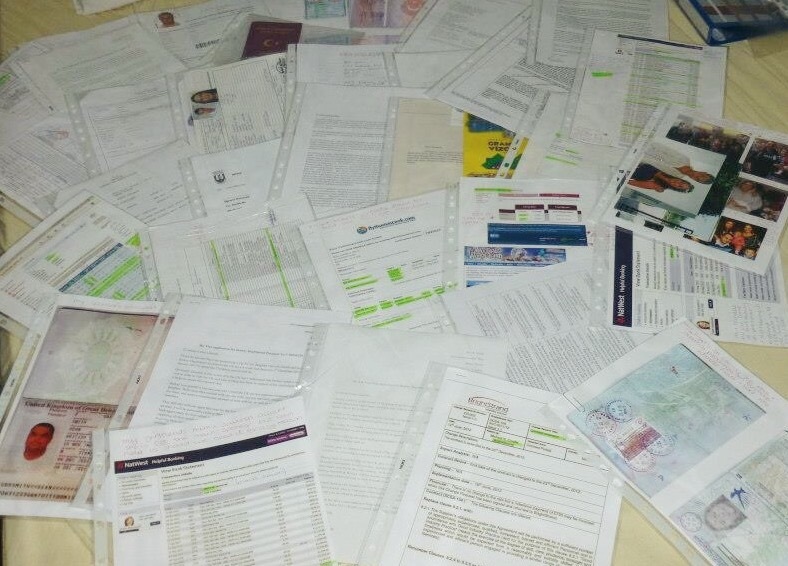 Just some of the things we had to show to convince them to give Berkay a visa for his 3 week holiday included a 20 page form, list of all his family ties, proof he was a student, proof of address, rent contract, 6 months bank statements, a letter from his boss stating he had a job to return to, insurance papers, police check, a 5 page letter explaining why he wanted to visit, a letter from me, proof I exist, photos of us together, a planned itinerary + expenditure, a letter from one of my family members who would be his sponsor, proof they exist, proof of address, bank statements, job status and a letter stating Berkay could stay with them for the 3 week holiday. Can you imagine having to show all of the above just for a 2 week holiday to Turkey? If us British people had to show all of that to visit, we’d never bother to leave the country! Doesn’t it put it into perspective, it’s not really that much effort to log on to the evisa website, submit a few details and press print is it? That’s not even considering the fact that that can be done from the comfort of your own home (unless you haven’t got a printer..) To apply for a visa to the UK, Turkish (and most non eu-nationals) have to travel hundreds of miles away to their nearest British visa application centre. For us, it was Izmir, 4 hours away from Fethiye, and 4 hours back again – an 8 hour round trip. Some people even have to travel to different countries to apply. Plus the running around involved in getting all the documents from the many different people and places, and printing, photocopying and translating them all into English. Compare that to the effort it takes to fetch your passport from a hidden drawer somewhere in the house and enter your name, date of birth and verification code on the evisa website…. there really is no comparison, is there? As for the £13 fee, the fee for Non-eu nationals to visit the UK is £80, plus the bus/train/car journey to the visa application centre, and the fee back again to collect the decision 2-3 weeks later or the fee for the courier to deliver it by special delivery instead. There’s also the fee to print, photocopy and translate the documents… so the £80 fee turns more into a £250 fee. £13 doesn’t look like such a ‘rip off’ afterall, does it? The last point was something that I saw posted on a Facebook group recently. “We have property in Turkey we should be able to visit when we want without visas” – well, in theory perhaps, but when the situation is turned around and family’s in the UK are separated from their non-eu partner at Christmas because they are unable to get a visit visa for a holiday, people say “you should have thought about that first, you made your bed now lie in it”, does the same principle not apply then? Why buy property in a foreign country and then complain you can’t visit as often as you’d like due to visa restrictions? A lot of people also seem to assume that the difference in difficulty and price is because of the fact that ‘foreigners visiting the UK get nhs and benefits’ .. really? If it was safe to do so I’d post a copy of Berkay’s visit visa on here which clearly states on it “no recourse to public funds” which means no benefits, and no free healthcare. He had to purchase travel insurance before travelling to the UK, just the same as we purchase travel insurance to cover us for medical issues when abroad. I think a lot of people truly do not realise just how difficult the process is for non-eu nationals to visit the UK. We are blessed that Berkay has been granted 3 visas, but that doesn’t mean he will be granted future ones, there is always the possibility of refusal and all that wasted time, money and effort. It’s something we, and millions of other people just have to deal with, but please do spare a thought next time you complain about the visa process for visiting Turkey. It’s not a rip off, it’s not a lot of effort and it’s not that the Turkish government has a vendetta against British holiday makers at all. Instead, be thankful that we have British passports which allow us visa free and/or fairly easy travel to most countries in the world, and be thankful that Turkey doesn’t have a reciprocal agreement and invoke the same requirements for a visa as the UK, because then most of us would probably never have visited the beautiful country in the first place. Brilliant! Most people have no idea how difficult it is for a Turkish person to get a visa to come to England. Great post! It’s frustrating that sometimes people don’t realise how easy they have it and they go around making such comments. I couldn’t believe it when I found out my Turkish friend had to get a transit visa for the UK just cos she had a connecting flight from Istanbul to London to Philadelphia. She was only in the airport for two hours! You forgot to mention not only the visa fees but the fees for the translations and the authorisation stamps plus of course the travel to either Ankara or İstanbul hotel for overnight stay the couriers fees. Near 1000 sterling when you count everything up and no refund for a refusal. Amen! Same for a US passport! Even married, we dread trying to get hubby back in the US for a visit in the future! I really feel for you both, and very well said! This reminds me of what it was like being a Commonwealth immigrant coming to the UK years back. The paperwork, humiliations and some pretty ignorant attitudes. At the time, sections of the UK population thought it was only right and proper to give people like me a tough time at ports and airports, and through other bureaucratic channels. Lovely! Then, when that was out the way, seeing and hearing “get back to where you come from” scrawled on walls or out of the mouths of the not-too-pleased-to-see-us brigade. It’s far, far easier to come for a holiday to Turkey. With Turkey, coming in is straightforward, whereas actually being here is a money-making exercise. If you stay here for more than 3 months in a year, you must apply for a Resident’s Permit. And applying for a Turkish Resident’s Permit can be quite involved. So, once you are here, the laws are fairly strict — the authorities keep you on your toes, and you are always paying for something: private insurance, translators, notaries, landlords, banks, fees here, something has to be paid every six or 12 months. It is almost as if it is a case of “get ’em in cheap, then charge ’em high once they’re in”. And once you are Resident, you will be visited by the Turkish police to verify all is correct and true. That is fair enough. But it can be quite intimidating when your landlady says “the police want you” when you open your door to her and didn’t know anyone was coming to check up on you. 2. ask me “why” my skin colour is paler in my passport photo than it is now, as I stand before them with my slightly more tanned self, after being in the sun for a few months…yes, really. LOL. UK Immigration would never behave like that now.